Will Talking Mickey Mouse in the Magic Kingdom be losing his voice? 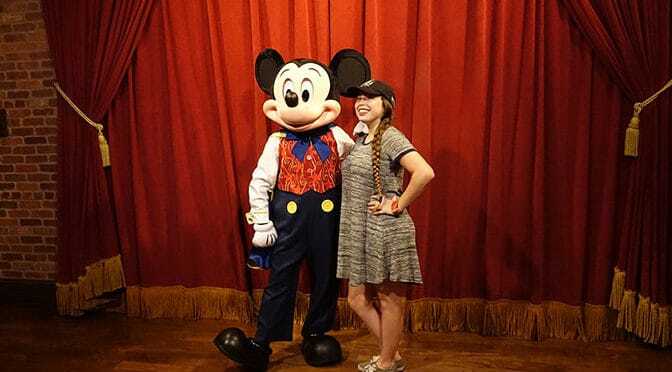 According to Cast Members who work with the “Talking” Mickey in Town Square Theater in the Magic Kingdom, Mickey may soon be losing his voice. According to insiders, Cast Members were informed yesterday that Mickey will cease the talking aspect of the Magic Words program in May 2018. Mickey will continue to offer a meet and greet in the Town Square Theater, but will cease the talking with guests aspect. Cast Members were told that this is because it confuses guests when Mickey doesn’t speak inside the other parks. I’ve been told that many injuries to Cast Members who are “friends with Mickey” and the difficulties involved in maintaining the tech invovled contributed to the decision. Over the last couple of months the wait times for this special Mickey meet have soared to 2 hours or more, mostly due to the tech and staffing issues necessary to keep this special offering running. You may experience times when Mickey does or does not speak over the next several months. Here’s a video that we recorded of “Talking Mickey” a while back, if you aren’t familiar with the program. The talking Mickey was amazing and the most special of our kids character experiences. I know it might be confusing for older kids but I hope they keep it as it was so special. Emotional injuries? maybe cause the cast member inside the Mickey costume decides to use his own thoughts instead those of Mickey? And maybe something vile comes out? only thing I can think of. That’s why the TV on Spaceship Earth showing the moon landing was broken for like a year and a half, right? And why half the automatons at Nemo don’t/can’t/won’t move? Just because it’s an easy fix doesn’t mean Diz will get it done. We go to Disney every year for the last 5 years because Mickey Mouse is my special needs daughter’s ultimate favorite!!! We watch Mickey Mouse Clubhouse all the time, so we always do a meet and greet with Mickey every year. We had just found out about The Magic Words with Mickey last year, and when he spoke his first words to her, she lit up with joy and was seriously star struck like never before! My husband and I both teared up to she such a beautiful and magical moment for our little girl. It just breaks my heart that we probably won’t get that moment again when we visit this year. I hope They will reconsider this decision. We were recently at the theater with my 15 month old grand daughter. She had an experience with Mickey that was out of this world. I think the benefit to the youngsters is worth the wait and the bother. Please reconsider. Please pass this comment on. Why does it matter. Donald Duck is the star of Magic Kingdom. If anyone should be talking, it should be the duck. NOOOO…this is so wrong! My grandson age 3 LOVED that Mickey Mouse, his favorite he sleeps with, came alive and TALKED to him and his smile and eyes of wonderment was worth EVERY penny we spent to go to MK! He still tells Momma how Mickey TALKED to him and sang HAPPT BIRTHDAY to him…it did NOT in anyway “confuse” him! Mickey wasn’t talking the last time I was at MK – so I am hoping that I get to see him this time, especially since it will be going away (1 1/2 weeks left ahhh…..) but my sisters were there over the summer and he wasn’t talking the day that they went to see him, so I was not counting on it. Fingers crossed – but with him not always being able to talk, I can understand why they would get rid of it – it has been there long enough that if it was an easy fix they would have already done it – and certainly much more disapointing for people to expect him to talk and then he isn’t able to at the point they are there. I think I understand what “friends of Mickey” means and if it’s causing them injuries then it definitely needs to be postponed and re-thought. I thought talking Mickey was a cool idea but when I met him about a year ago, I found it a little disturbing. I’m going back in less than 2 weeks and was planning on seeing Mickey at Epcot or the Studios just to avoid talking Mickey. That Mickey interacted with you made it “the must”!!! This makes me so upset!…it´s a back step!! He’s not only just talking to you in the theater but with the use of the artculated head in the morning court stage opening, Royal Friendship Faire, Festival of Fantasy, and Move it Shake it. It was the only place where Mickey was much more lifelike than any park. This must be disappointing for a lot of Disney guests. I remember seeing Mickey talk to me too. It was a long time ago though. I wish this talking aspect happened to all of the characters. If Chip and Dale talked to me, I would have LOVED the experience!!! This experience being taken away is just sad. No don’t take that away, that’s part of the magic! I love the talking Mickey.. It said happy birthday to me. And he was laughing making jokes. It was the best. I hope they keep the talking one. Maybe you should have all the mickeys talk. A least say hi. Oh no!!!! My daughter was so looking forward to see mickey that talked to her again this summer. : ( she’s going to be so upset!!! Get rid of all the Star Wars crap from Disney instead! This will confuse my 4 year old. We have had passes for 2 years and he always wants to do the talking Mickey! I’m 33 male and never had been to Disney before this year, I was blessed to be able to take my nieces and nephew. One of my favorite parts of the whole experience was talking Mickey. I had no idea walking into that building that he could talk, but it was truly Disney magic for me. We dont care how much it cost, or about the staffing issues. This is Disney world, fix the problem, make it better and keep the magic in the characters where it belongs! We love seeing Mickey when we go! And the fact that he interacted with you made it “the best”!!! This makes me so upset! Oh this is upsetting! My daughters favorite part and the whole reason we got season passes! I hope the revisit this decision! I am so glad I took my granddaughter for her first visit the week after Thanksgiving!! We had a meet and greet with Mickey and he talked to her. She was so happy to talk to Mickey and tell him she loved him. I am disappointed that this is the end of talking Mickey. Same here! My first trip back in 15 years meant so much to me, and discovering that a Mickey could speak to me was really emotional for me. This bums me out. This Mickey is my favorite of every Mickey in the parks, and I’ll never forget how surprised we were in 2014 when we visited the parks for the first time in 15 years — Mickey talked! It really was amazing for my then three-year old nephew, as it was the first bit of magic, Disney or otherwise, that he’d ever experienced. I am so glad we had the opportunity to hear Mickey sing “Happy Birthday” to one of our sons on his birthday. The expression on his face will be a forever memory. I’ve never got to experience this. So sad I can’t visit him just once before he goes. This kind of ruins the Magic for lots of families who have experienced this. I might go to MK in july for my 14th, so I may not be able to experience the true magic of this meet and greet. Though it mentioned something about “Mickey may not be able to talk for seven months”. Is this decision for a limited time? Is it affected only for seven months? Another thing I’m confused about, Why can’t disney release the talking Mickey in the other parks other than Florida? Why not in other parks like Paris, Tokyo, Hong Kong, or Shanghai? I hope Disney rethinks this. This is so disappointing as this meet and greet is truly special and unique. It even makes adults so happy, and is truly MAGICAL! I’m not sure why it’s “confusing” since none of the Mickeys are actually real (). And if that’s really an issue I would think they would have this technology available for all of them – not to take it away from the one that had it. Of course if it’s a safety issue, that’s most important. But I can’t figure why that would be so. I love the way you handle all these questions, Kenny. (Pirates CAN be great people!) I’m sorry to hear Mickey will possibly be losing his voice before our next trip. I hope they put a timeline out instead of leaving it to speculation like Stitch’s Great Escape. I wonder if Disney is going to create a reasonable “voice change” backstory in the queue, or maybe use overhead speakers like they do for Figment? It’s always been hit or miss so don’t come not on it even if you go tomorrow. Wouldn’t it be just as “confusing” that Mickey can’t talk anymore for return guests? If they remove the talking Mickey, they should stop calling it the “Magic” Kingdom. In my opinion, he is the most “magical” thing there. Every park should have something unique to it, that fits it’s theme. Was there right before Christmas, he didn’t talk then. In light of this news, contemplating a one day trip from WV so my daughter could experience this one last time. Any insight into how this will be phased out? I do not want to make a trip at the end of February or first weekend of March to discover that he is not talking. Thank you for all you do for us Disney Fans! HI Kenny! I think that they should keep the talking Mickey and expand it to the « other Mickey’s »… If there’s safety issues I’m sure that Disney can fix them. Mickey is special and it’s special hearing him talk! Thank you for the great work! I’m sad about this. I almost cried the first time I heard him talk. Coolest thing ever!! Good answer. The safety of cast members should always come first. “Injuries to cast members”?? Huh?? I see someone above asked the same question and you chose not to elaborate but it leaves a BIG unanswered question for your readers. Some questions are okay to leave unanswered in detail. So agree!! This is so sad! Doing the”hot dog” dance with him with my mickey obsessed 2 year old will always be such a magical memory! Seriously one of my fav character meets!! Hoping to get to see him in our first trip in April! Guess I’ll try to get a fast pass if available! My nephew loves talking Mickey..he actually requests to visit “talking mickey” so now will be hard to explain why he doesn’t talk anymore..if it happens. Having Mickey sing happy birthday to him on his first birthday was truly magical. We were there last week and he did not talk during our the visits to MK. We didn’t mind, the meet seemed to be longer than it was when he spoke. I agree. This should be something that imagineers should work toward. The experience was very cool but I just don’t like the way he looks in pictures. He doesn’t really look right… However, it was a magical memory. Thank you. So it’s smaller than a bread box. You wonder why not revealed in testing phase. It was unique while in use. So sad! So glad we have a FastPass next month for one last time. OK. It leaves open if guest related or Tech related. Heartbreaking. This is the most magical meet and greet IMO. Sad to see this go. So glad we experienced this on our last trip with our littlest Mickey fans. I wish Disney would reconsider this one. ’ve been told that many injuries to Cast Members who are “friends with Mickey” and the difficulties involved in maintaining the tech invovled contributed to the decision. Can you elaborate? No I chose not to do that. My kids think that is the REAL Mickey. That is really sad news. I highly think they should reconsider. This is sad. We love talking Mickey.